As I walked a tree-lined fencerow, I heard a buzzing noise like the sound of a hot beehive. I was about thirty feet away from a spruce tree where the sound was coming from when I first heard it. I went to investigate, thinking I would find swarming bees. 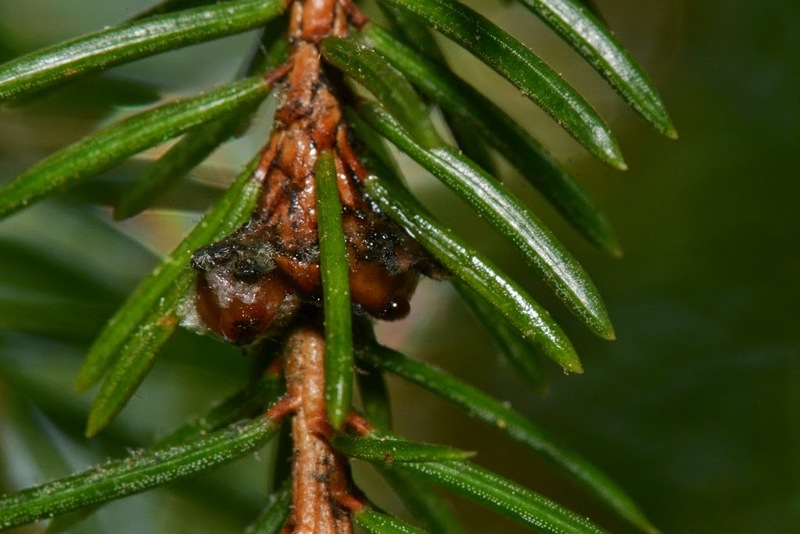 Instead, I found the buzzing noise was a matter of scale - Spruce Bud Scale insects - to be exact. 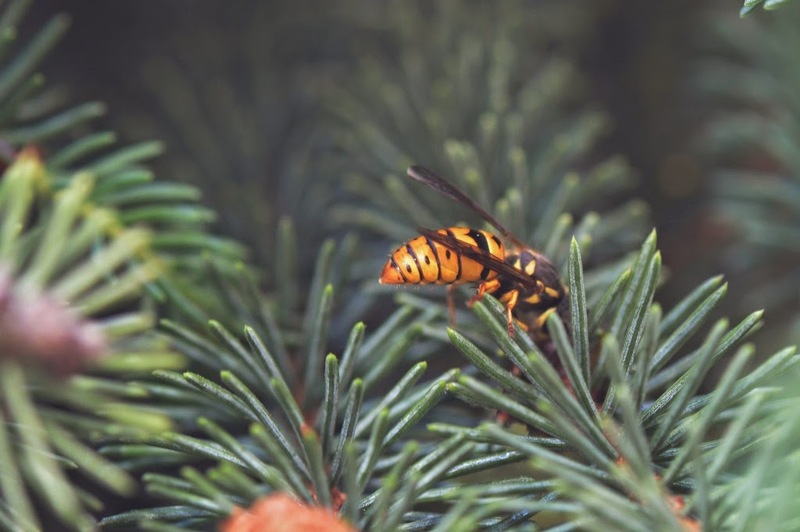 When I arrived at the spruce tree to see what the buzz was about, I found myself standing in a honeydew rain and being buzzed by many yellowjackets. 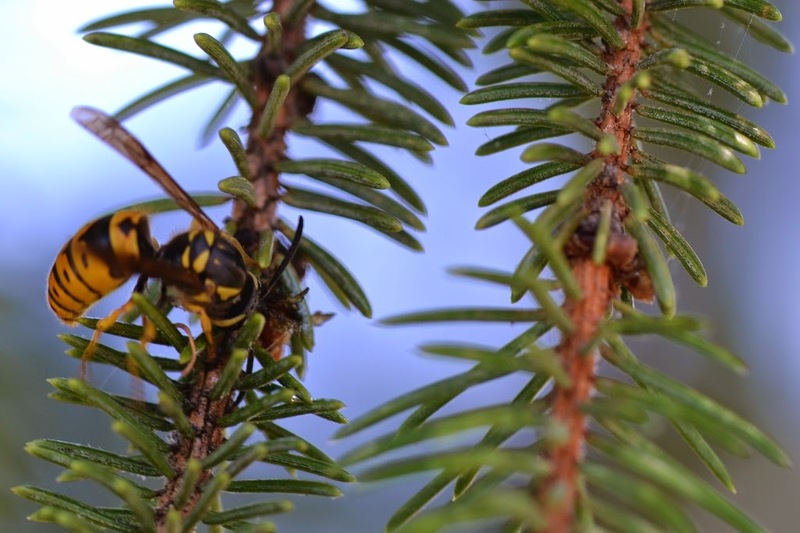 The industrious Yellow Jackets were collecting honeydew from the Spruce Bud Scale insects infesting the spruce tree. 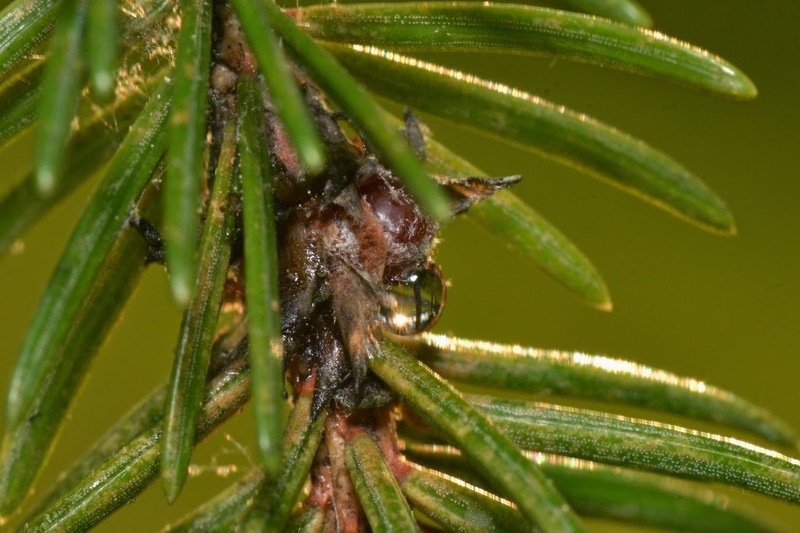 This next photo shows a Spruce Bud Scale with a droplet of honeydew. The honeydew could be described as the waste product, or excess, from the scale insects processing of the spruce tree's sap. 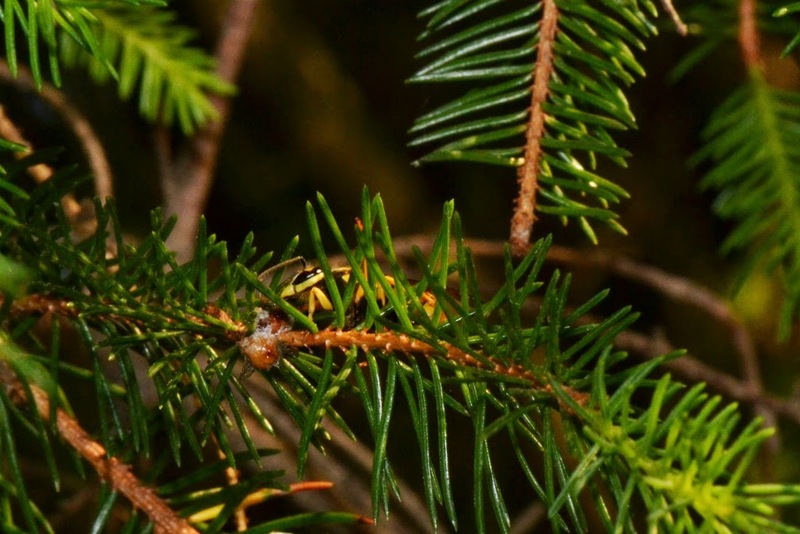 The yellowjackets seemed to have a difficult time getting to the scale insects because of the pine needles. I saw the yellowjackets try all kinds of positions and maneuvers to get to the honeydew source. 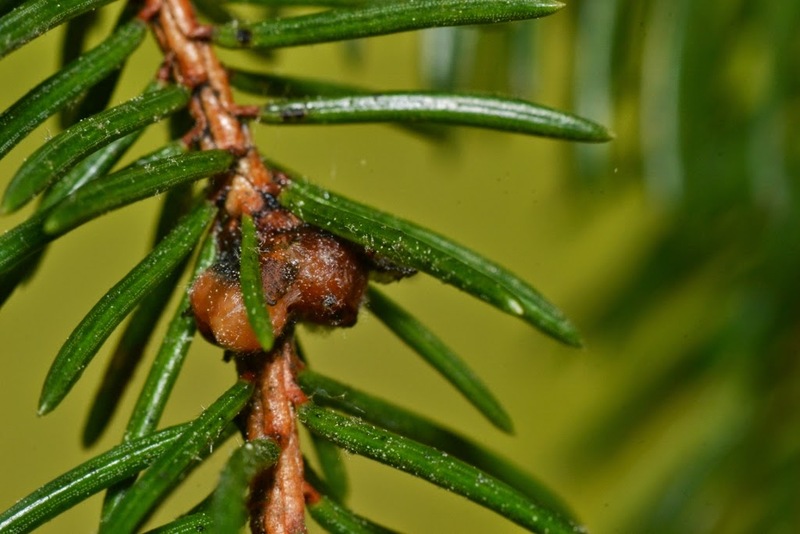 Here is a close-up photo of some Spruce-Bud Scale insects - they don't look like much more than some kind of lumpy growth on the spruce branches. Here is another photo of the Spruce Bud Scale. I guess you could say they look like buds, and come to think of it, that's probably how they got their name. You would hardly know these were scale insects except for all attention those "lumps" or "buds" were getting from the yellowjackets and the occasional drop of honeydew. If you look deep into this glistening droplet of honeydew you can see the row of trees in the fencerow and the setting sun over Sideling Hill Mountain - It's rather odd for me to look at my boyhood home area through the lens of the waste product from a Spruce Bud Scale insect. .... To think that I got to experience that view because of hearing a loud buzzing noise that was simply a matter of scale.